N E W Facebook page  with more info For hints on customising your view of this site click here. 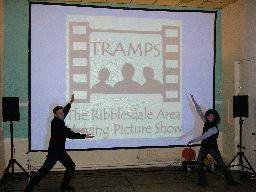 TRAMPS is a not-for-profit voluntary group that provides a high quality, low cost mobile cinema service to run film events at community venues. 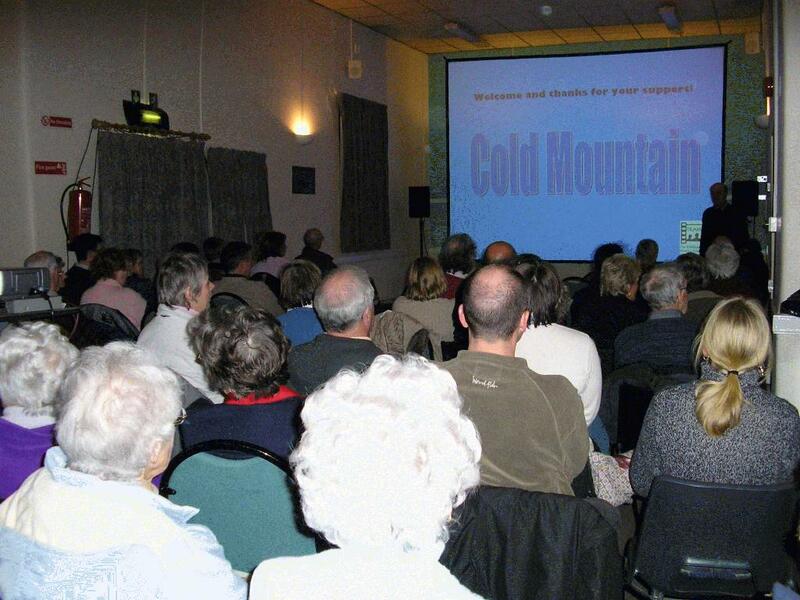 It was set up in 2002 by local people as a response to the Community Investment Prospectus public consultation process in Settle, which highlighted the demand for a cinema in the Ribblesdale area, as the three nearest cinemas are all around 25 miles away. We operate within roughly a 30-mile radius of Settle. We organise film shows ourselves and also help other groups run their own shows using our professional quality equipment (see below). The group is run entirely by volunteers and we are always looking for people to help with film shows and running the group. To find out more please see below. TRAMPS has been financially supported by a number of funding bodies to buy the equipment and to help with the group’s development. TRAMPS has a formal constitution. For the most part, a film is shown each month on two occasions at two different venues in the Ribblesdale Area. The web site always carries the future programme in both summary form and in glorious Technicolor™. Shows normally start at 7.30pm and tickets are usually £5, available on the door. If you would like details of forthcoming shows sent to you by email, please please click here. To keep running costs to a minimum, we regret that we are unable to send details by post. 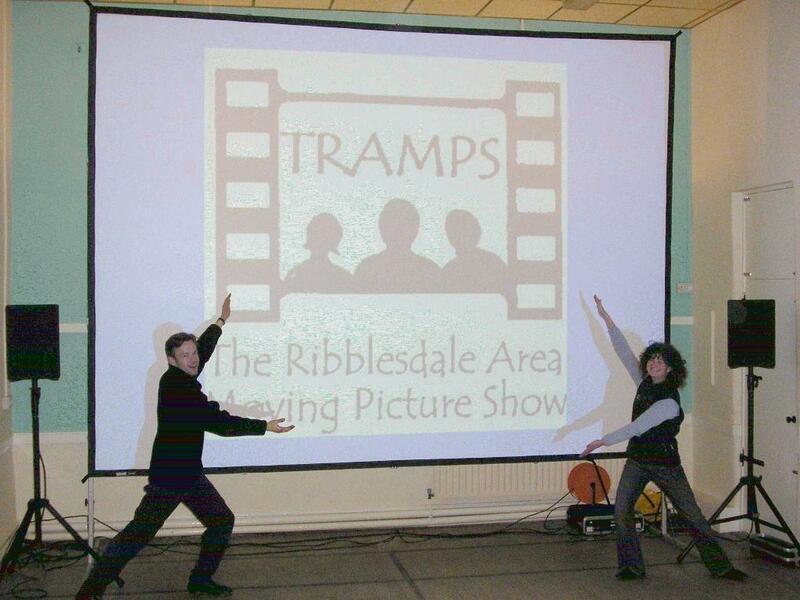 If you are interested in booking TRAMPS for a film show or organising a show yourself using our equipment please contact John Vendy on 015242 62083 or email john.vendy@zoho.com. Either we or the venue provides refreshments and arranges volunteers to sell them and to tidy up afterwards (whoever does the refreshments takes the income). You provide refreshments and arrange volunteers to sell them and to tidy up afterwards, and you take the income. As the film shows are public events, we have to adhere to the public performance and copyright laws. This means that we have to rent DVDs from a recognised distributor. Alternatively, we can get a licence from the distributor and then you can use your own copy or one rented from the corner shop. The fee is usually £116 (£100 for licence only) or 35% of the ticket sales, whichever is the greater. The distributor we have an agreement with is called Filmbank. Their current list of films available on DVD and/or video can be seen here. To check whether your venue is properly licensed to show films contact your District Council Licensing Officer. You can also hire all or some of the equipment at low cost for fundraising events, conferences, meetings etc. We are always looking for new volunteers to help with film shows and running the group. This includes helping to set up and operate the equipment, helping to serve refreshments, publicising film shows and distributing posters, etc. Volunteers generally help at shows about once a month at venues close to where they live. However involved you want to be, we’d welcome your help. If you are interested please or send us a message by clicking here. Grants have been used to set up the group and buy the equipment. We currently don’t receive any assistance with on-going costs, and so all income generated from film shows is invested back into the group. As a rough guide, the system can be transported in a medium sized car with the rear seats folded down. For booking enquiries contact John Vendy on 015242 62083 or email john.vendy@zoho.com. To be put on an email list for details of forthcoming shows please click here. For enquiries about volunteering, film suggestions, or anything else please click here. There are other web sites called TRAMPS over which we have no control and with which we have no relationship beyond the accidental similarity of name. Sadly, at least one of them is one with which we certainly would not wish to have any relationship.